Quay Point Plastering have been undertaking damp proofing throughout the south of England and the channel islands for over 35 years, all our work is covered by a 30 year bonded guarantee, issued by Biokil Crown Ltd (Registration No B6665265)who are one of the largest damp proofing companies in England. We are also registered hazardous waste carriers meaning we can dispose of all old render and building waste in an environmentally safe manner (Registered number: CB/VN5214BN). We understand exactly what causes rising and penetrating damp, our expertise combined with our products prove we are 100% effective in eradicating all damp issues. Rising or Penetrating damp can cause secondary damage to the structure of a building, with plaster and mortar liable to crumble as they become contaminated with salts and nutrients which may rise from the soil below. It is imperative that these problems are dealt with early; otherwise it can also cause wet or dry rot in skirting boards and floor timbers. Quay Point Plastering have a huge commitment to customer service, where we believe in not only a safe working area for our clients but also that our work is carried out to a very high standard, as a means of measuring this commitment we invite all our clients to write a review after we have completed our work. 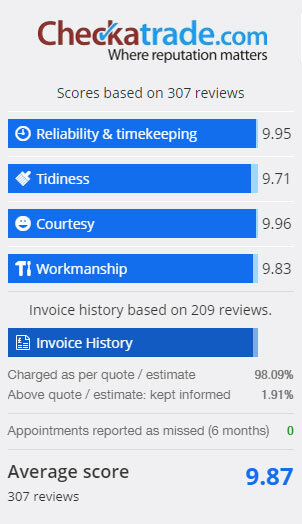 All our reviews are recorded and verified by a third party and available to view on their website, please click the checkatrade link to view all our customer reviews. A full gallery of photographs of the work we have undertaken, can also be viewed on our Checkatrade pages, please click this link to view them. BioKil contractors for the installation of a new damp course & timber treatment. We can deal with rising damp on walls which is often caused by ground water moving up through a wall. If the Damp Proof course is missing or ineffective, or when the level outside your home is higher than the Course, water can rise up the wall causing all sorts of problems. We are happy to advise on the right sort of treatment for any problems you may be experiencing, so if your Damp Proofing in Poole, isn’t working effectively, we can recommend a number of solutions to remedy the situation, we can drill holes in your wall and inject a liquid solution but there may be alternatives, so why not call us today for a free survey and quotation. We would just like to say, never seen plastering like it. Great to have tradesmen. Another local Woodworm company as you know told us we had an active infestation of wood boring beetles. Due to your honesty we know there are none, which has taken our worry away and as a result saving us a lot money. Danny's work is simply outstanding and I cannot thank him more for doing a 1st rate job. He arrived as planned, got straight to work and worked like a Trojan throughout the day. He covered everything with dust sheets, ensured any mess was minimised and cleaned any spills quickly. When Danny had finished he made sure that I was happy with his work, explained what would happen with the drying plaster and advice on painting. Two days later the plaster is completely dry and I cannot believe how smooth the walls are of my Victorian bedroom. In summary, an outstanding plasterer and simply the best! Outstanding work. The damp-proofing job was very well priced and completed promptly. Definitely recommended. Fantastic and professional- would recommend to friends and family.